"It is all so simple, a fingerprint, an impression of my finger – the printed mark. Black? Blue? Red? … Yes black. The black is so dense and dark, cold and strong and fits well with the definition of a stamp, albeit a life printed". Human fingerprints are translated into numerical symbols, coded through the artist’s drawings and used as symbolic data. Patterns that merge are also to be lost, woven and undone again, in layers adding complexity in the language of code and information architecture. The artist strives for simple representation, the artworks to appear non-technological and seemingly painterly, a result that belies the underlying infrastructure and composition of this creative endeavour (Gates-Stuart). Gates-Stuart, E: FingerCodes Exhibition Catalogue. Gates-Stuart, E., & Wohlfeiler, R. (2011). Finger Codes. IMPRINT: The Journal of the Print Council of Australia, 44(2), 32. Musa, H. (2011). 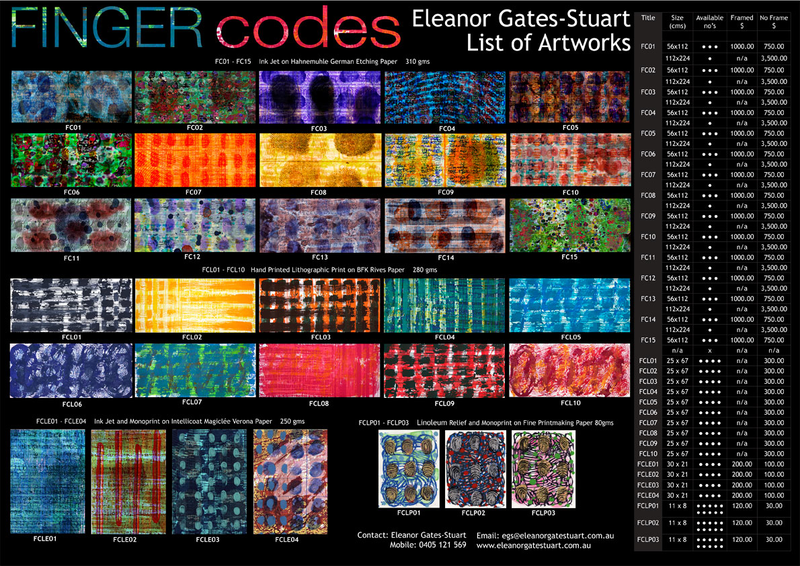 Eleanor Gates-Stuart: Cracking the finger codes. Art Monthly Australia, (145). Publication: Musa, H. (2011). Eleanor Gates-Stuart: Cracking the finger codes. Art Monthly Australia, (145). Publication: Gates-Stuart, E.; Wohlfeiler, R. (2011). Finger Codes. IMPRINT: The Journal of the Print Council of Australia, 44(2), 32. 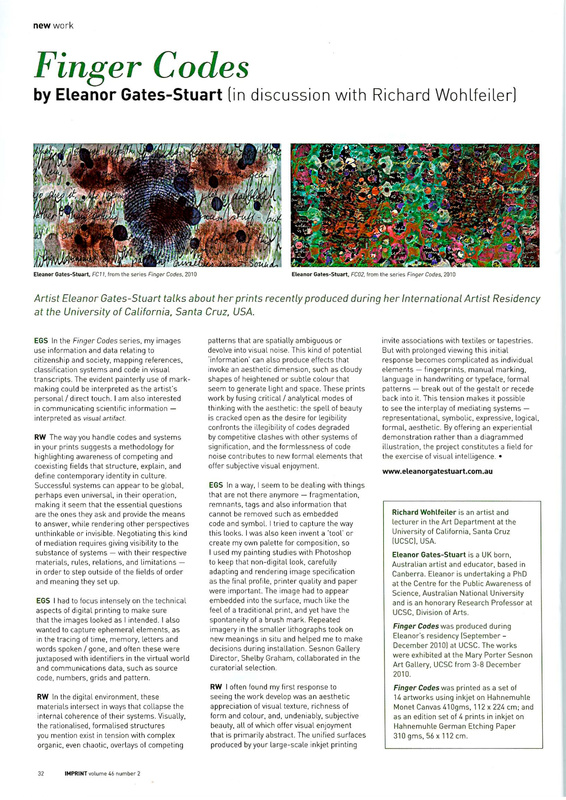 Eleanor’s status and responsibilities as “Visiting Artist” in print media were multiple and layered: teaching students, producing artwork, interacting with UCSC faculty and staff, and having her own experience of Santa Cruz, the campus, and art community. That all of this had to happen in the compressed span of one academic quarter could be productively catalytic or a potential muddle. The personal resources that she brought to the task—I’m thinking of her intellectual engagement and energy, her awareness of and interest in the students as individuals, her accessibility and enjoyment of communication—seem to me to have tipped the experience toward the former. Busy with my classes and spending hours in the print studio to experiment and explore my own projects, I frequently encountered Eleanor there and, over the quarter, we managed to maintain an ongoing series of discussions and conversational exchanges centered on and generated by the complex nature of the place: teaching, learning, art ideas, technical processes, conceptual processes, and the ways in which all of these are involved with the broad activity of making art. I appreciate the genuine engagement she showed in being a “Visitor” in the full social sense, participating energetically in the creative life of the studio and the department during her brief stay here. This dimension of the exchange has hopefully started currents that will continue after she leaves. Seeing Eleanor in the studio several times each week gave me the opportunity to observe the variety of processes she employed on the way to developing her ideas into their final embodiment as prints. In significant ways, it’s a privilege to be able to see an artist’s work evolve and come together, because often our experience of a work of visual art is only in its completed form, which can have the misleading consequence of giving art the identity of a commodity product rather than as a manifestation of a variety of kinds of thinking. By giving importance to chance, intuition, irrationality, enjoyment and feeling, the ways in which the creative activity of visual thinking productively expands the category of “thought” augments the possibilities of conceptual discourse beyond conventional expectations of rationality and conventions of certain logical procedures. Eleanor’s sense of the relationships among concepts and processes is evident through her use of materials and sources and the many transformations, deconstructions, combinations, and recombinations that these undergo as she builds the work. Some of the processes I noticed were manual drawing using both conventional and unconventional materials, scanning to digitize these, manipulation of digitized material in Photoshop through a broad range of transformative possibilities offered by that tool, digital printing, creation of photo litho plates from hand-drawn sources, and multi-plate lithographic color printing. She made extensive use of her opportunities to explore both our digital and traditional facilities in print media. 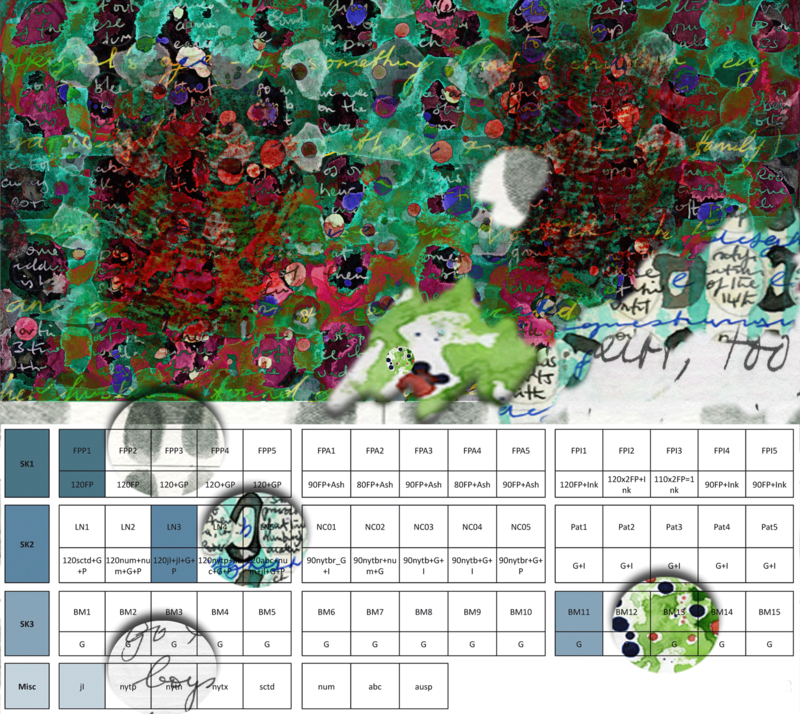 There are undoubtedly others she could tell you about, but approaching the printed images in terms of coding practices highlights aspects of various orders of presenting and reading information visually. Further thinking about this might even lead to attempts to distinguish between “information” and “knowledge”.